I took a trip to Las Vegas, and I would have been remiss had I not taken the opportunity to visit some of the more notable bars. Bars abound in Vegas, but most are the sort where you order Fernet on the rocks. I did some research ahead of time, and I made it to most of the ones on my list. The first was as José Andrés’ Bazaar Meat. Andrés is a protégé of Ferran Adria, of elBulli fame. His bar and restaurant are not competing at the tier of his mentor, and in fact, the space itself is understated. Compared to the rest of Las Vegas, it is downright plain, though it fits with the minimalism (some might say, dumpiness) of the SLS, the casino/hotel that contains it. As you can see, the space is uninspiring. The bar is designed to emphasize function over form, and the harsh red lighting is anxiety-inducing. Clearly, this is a place that has sacrificed aesthetics in order to cater to a high volume of customers. Many of the small plates we ordered followed this philosophy; the platings and concepts did not live up to my hopes for a big name chef like Andrés. As a counterpoint to these criticisms, the barstaff was well organized, and executed our drinks with consistency and aplomb. Despite my many criticisms, I believe that their failures were strategic, as opposed to tactical, in nature. I ordered both this drink and the famous Ferran Adria “salt air” margarita. They were similar, both employing a salty “air” made by blending water with sucro, a proprietary sugar ester that can form stable soap-sud-like foam when aerated. The picture of the magarita looked exactly the same. The margarita version was better. To me, this drink didn’t taste much like a martini. Astute readers will notice that it contained no gin and no dry vermouth. Scandalous! In fact this tasted like a glass of cold olive brine with salty soap suds on top. It had nothing that I enjoy about a dirty martini and two different molecular gimmicks. I’ve had sucro airs on cocktails before, and they can be very effective, but this drink was simply bad. There was also a reverse-spherified olive sitting at the bottom of the drink. Unlike sucro airs, reverse-spherification is always disgusting. Without a doubt, it is the worst tool in the molecular gastronomists’ arsenal.Novelty has its place, but it must sit atop a foundation of quality. This cocktail was aged, not in a barrel, but in a leather bag that they keep at the bar. I have always wanted to put the flavor of leather into a mixed drink, but this was not the leathery libation of my dreams. The fortified wines overpowered all of the other flavors, leaving me with an oxidised (in a good way), acidic mess that had some leather in the-mid sip, but ultimately did not deliver on its promise. This drink would have been much better as an old fashioned, and with a bourbon instead of a rye; great concept, disappointing execution. I do not have much to say about this one. It is a fully standard Manhattan, smoked in a bottle. It was made with tasteful spirits, it was well-mixed, and it was well-smoked. Although this type of presentation is now commonplace in the world of haute mixology, I enjoyed the drama. 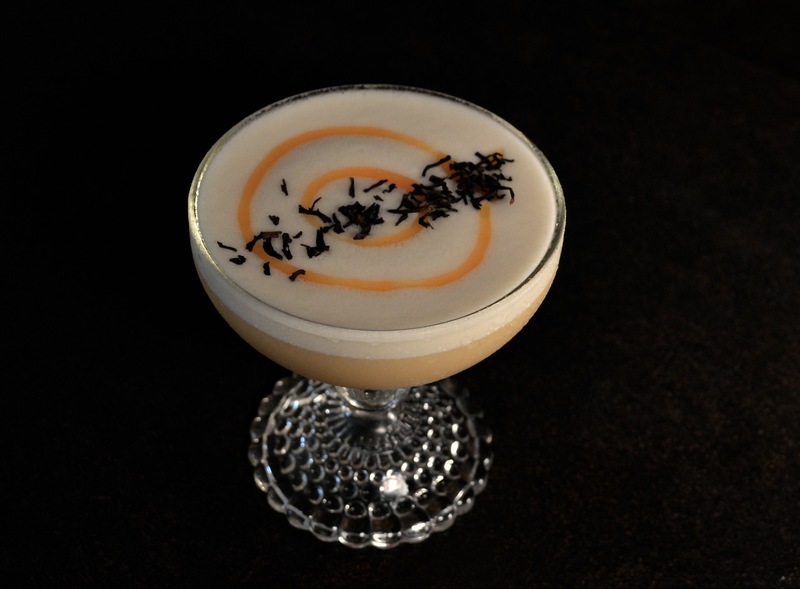 The juicey, sweet qualities of this drink were redeemed by the intrigue of truffle essence. Clearly, the essence in question was of the synthetic variety, but I wanted a truffle cocktail, and I got one. The flavors were balanced, and the truffle, which could have easily been overpowering, was subtle. I think I would have preferred some kind of green herb as a garnish on this one, but it was more successful than not. If you find yourself at this bar, it was worth ordering, but it wasn’t worth the trip. Then again, visiting a restaurant by a top name chef is less about the quality of the food and more about the social signal it sends. In addition to the drinks, my party ordered a variety of small plates, and a grilled skirt steak. They were good but not outstanding. The best bite I had was a tiny sphere of foie gras mousse surrounded by cotton candy. It was cheaky and playful. The worst bite I had were the so-called patatas bravas, which amounted to thick-cut french fries decorated with aioli. I enjoy trying new restaurants, and the experience of discovery and adventure is worth the price even if the food and drink itself is disappointing, as it was in this case. If you find yourself in the SLS (a dubious choice), you would do much better to go to the Umami Burger adjacent to Bazaar Meat. They’ve never steered me wrong. Categories: excursions, modern drinks | Tags: alcohol, bars, cocktail, cocktails, drinking, drinks, Ferran Adria, haute cuisine, José Andrés, Las Vegas, liquor, mixed drinks, mixing, mixology, modernist, molecular, molecular gastronomy, salt air, spirits, steakhouse, sucro | Permalink. If you were reading last week, you might have noticed that three out of five of our drinks featured cheese in the garnish. This was no coincidence, but rather a deliberate study using cheese as an ingredient in a mixed drink. I do not have a whole lot to add to the content of those posts, but I will note that while I think cheese can be an effective garnish, it is a positively disgusting ingredient to actually mix into a drink. Do you want to drink alcohol broccoli cheddar soup? Me neither. We used kefir yoghurt to try to bridge the distance between pineapple and gin, on the one hand, and blue cheese, on the other. As the imbiber takes a sip of the drink, the smell of blue cheese fills the nostrils, creating a surprising synergy with the pineapple juice. Kefir is a fickle beast, as a cocktail ingredient, but the pineapple tames it nicely. You could almost call black tea, tomato, and grilled cheese a rainy day survival kit. We clarified fresh heirloom tomato juice using a coffee filter, and paired it with earl grey-infused Pisco. Savory drinks are hard to love, but the tannin in the black tea went very well with the tomato’s umami notes. Unlike in the Pineapple Under the Sea, you couldn’t really smell the cheese in the garnish, but it was still a tasty snack. The strength of the cheese in this drink was somewhere in the middle between the other two, with the cooked Parmesan contributing a subtle aroma to bolster the flavors of strawberry and honey. This was the weakest drink of the trio, and even though the nuttiness of the cheese matched well with the flavor of the honey, it left something to be desired. Actually eating the Parmesan wafer was pleasant. We used honey to “glue” the wafer to the glass, so that even though it appears to be resting precariously on the rim, it was in reality quite sturdy. 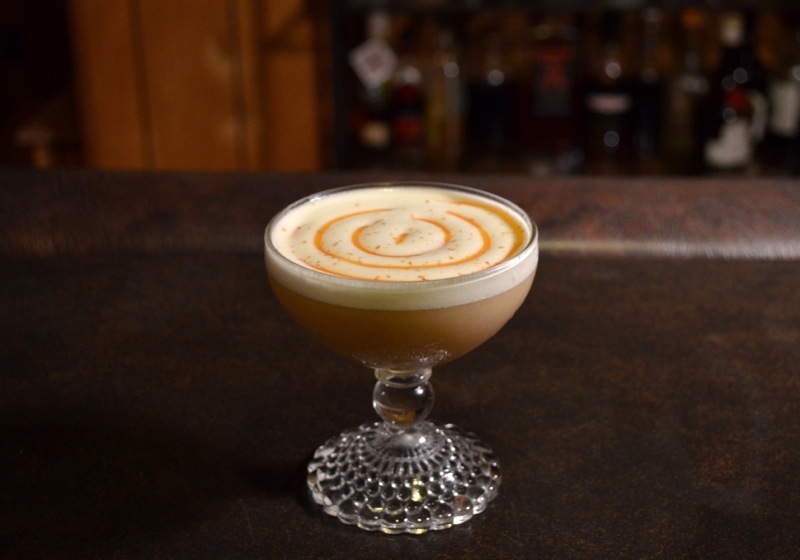 Categories: original creations | Tags: alcohol, bartending, black tea, blue cheese, booze, cheese, cocktail, cocktails, craft cocktails, drinking, drinks, garnish, gastrophysics, grilled cheese, infusion, kefir, kefir yoghurt, liquor, mixed drinks, molecular gastronomy, molecular mixology, parmesan, pineapple, pisco, tomato, yoghurt | Permalink.